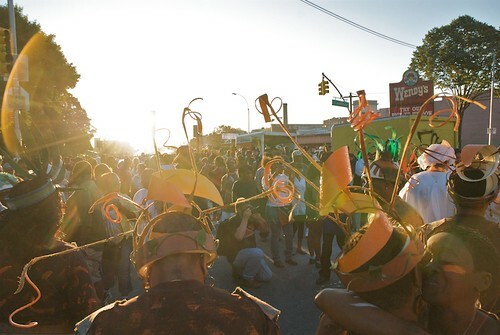 Starting at about midnight Sunday night, sections of Flatbush Avenue and Eastern Parkway were cordoned off for J'ouvert (An all night street party - J'ouvert is a contraction of the French jour ouvert, or dawn/day break) and the West Indian Day Parade. Streets are Public Space. New York’s streets belong to all of her residents – not solely to car-owners. Streets are Our City’s Primary Communications Platform. Whether using a street to get from point A to point B, or informally browsing a street to learn about new shops and trends, or participating in a parade, city streets should facilitate all kinds of exchange – not just transportation. Streets can be Reprogrammed. Though it’s difficult, and requires a lot of initiative, there are myriad productive ways we can use a street if we put our mind to it. One of the things that’s great about a parade, is how slow and frenetic it can be, all at once. We should turn to our streets to be enlivened and enriched, and to participate in the exchange of the city every day. Older PostDC-area commuters arrange impromptu ride sharing with "slug lines"